Financial organization Merchant Cash USA ranks the best cities for female entrepreneurs to reside in due to various factors from a client survey and census data. The top ten cities are listed below. “Oklahoma City is a mecca for young professionals and entrepreneurs who can excel at various industries in an area which is extremely friendly to the small business owner,” says the CCO of Merchant Cash USA Darrin Landau. In conjunction with Women’s History Month and International Women’s Day, Merchant Cash USA releases its survey results on the best cities for female entrepreneurs to live and work in. Women’s History Month is a time to celebrate the accomplishments of women in the business world and to become aware of the daily challenges these women face. According to American Express OPEN’s State of Women Owned Business Report, it is estimated that over 9.4 million women own businesses in the United States – which is roughly 30 percent of all businesses in the country. This brings in over $1.5 trillion in revenue and employees nearly 8 million U.S. individuals. 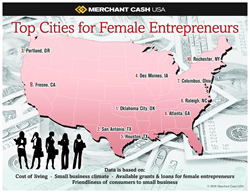 Merchant Cash USA wanted to know what the best cities were for budding female entrepreneurs looking to operate a small business. The small business financial lender used 2015 census data from some of the most highly populated cities, and ranked particular cities according to cost of rent for a home or office space, number of small businesses per 10,000 people, and the average unemployment rate per city. The organization also looked into what was available financially for female entrepreneurs looking for funding. Merchant Cash USA analyzed what grant and loan options existed for women-owned businesses in various states across the country. The financial lender also asked various female small business owners, through a third-party email campaign, to rate the city in which they lived on a scale of 1-10 (10 being the highest) based on numerous factors such as: cost of living, small business climate, opportunities available to females business owners, and friendliness of individual consumers to small businesses. The results of the survey are listed below. Oklahoma City came in the top spot on this list due to its great cost of living, low unemployment rate, and the revitalization currently happening in the city. The cost of living for someone self-employed is more than 10 percent below the U.S. average. OKC is home to over 19,000 small businesses, and the cost of living is 5 percent lower than the U.S. average. Oklahoma City appeals to the budget conscious business owner who is looking to cut costs on things like rent and supplies. Merchant Cash USA was founded in 2015 to help businesses grow by obtaining the cash flow they need. The organization's mission is to offer small to medium size business owners cash advances without the hassle of big bank requirements. Visit merchcash.com to find out more of follow us on social media. Facebook and Google Plus: Merchant Cash USA and Twitter: @merchcash.